NASA will announce new discoveries made through the planet-hunting Kepler space observatory in a briefing Wednesday (Feb. 2). The space agency said publicly in advance only that it will discuss astronomers' "latest findings about planets outside our solar system." NASA scheduled the press conference for 1 p.m. EST (1800 GMT) at its headquarters in Washington, D.C.
NASA's Kepler spacecraft is a space-based observatory dedicated to the search for extrasolar worlds – alien planets outside our own solar system. To date, more than 500 alien planets have been discovered by astronomers. NASA is using the Kepler spacecraft to search for planets that circle their parent within or near the "habitable zone" where liquid water could exist. "The news conference will follow the scheduled release of Kepler mission science data on Feb. 1," NASA said in statement posted to its website. "The data release will update the number of planet candidates and is based on observations conducted between May 2 and Sept. 17, 2009." William Borucki, Kepler Science principal investigator, based in NASA's Ames Research Center, Moffett Field, Calif. The Kepler spacecraft uses a super-sensitive photometer to monitor the light from more than 156,000 stars in an area located in the constellations Cygnus and Lyra. When potential alien planetscross in front of their parent stars, they can cause a dimming effect in the star's light that Kepler can measure, NASA officials said. This month astronomers using the Kepler spacecraft announced the discovery of the smallest alien planet yet seen. That planet, known as Kepler-10b, is about 1.4 times the size and 4.6 times the mass of Earth. It circles a star 560 light-years from Earth. But the planet Kepler-10b is not in the habitable zone of its parent star, scientists said. Kepler-10b is much closer to its parent star than Mercury is to the sun, and completes one orbit every 0.84 Earth days, scientists have said. Finding a promising extrasolar planet within a star's habitable zone is a chief goal for the Kepler mission, NASA officials said. 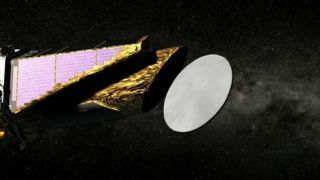 "Although additional observations will be needed over time to achieve that milestone, Kepler is detecting planets and planet candidates with a wide range of sizes and orbital distances to help us better understand our place in the galaxy," they added in the statement.